Meritage Home Builders is an award-winning luxury home builder. At their Phoenix office, Embossed Tipped leather is direct-glued to a private office and conference room ceiling. Embossed Tipped is a two-tone leather achieved through the base dye coloration followed by a treatment where the tip of the pebble grain is dyed by hand with a dark overtone. 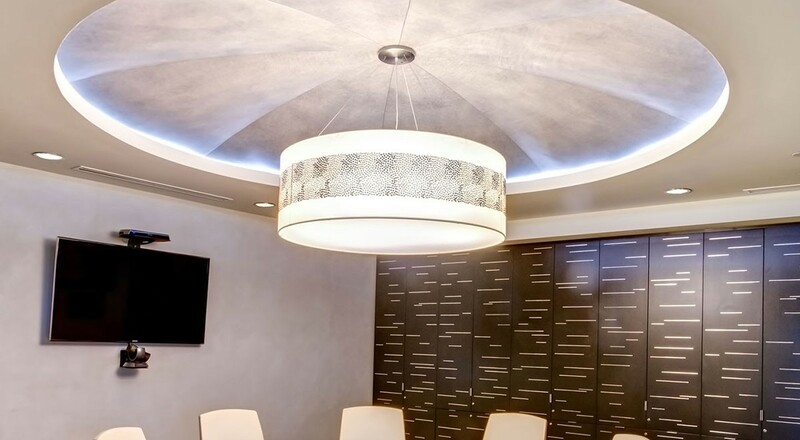 ET 0180 Gray Fox is adhered to a drop soffit in an executive office and inset within a recessed cove ceiling in a conference room adding softness and texture to an otherwise commonplace ceiling. For more information, please visit the Embossed Tipped (ET) product page.